I wrote this pattern long before this style of hat was being used as a political statement. 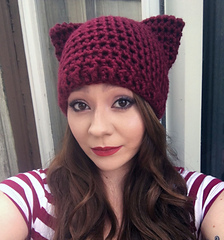 The hat has nothing to do with politics - it’s simply a cute beanie I designed because I love cats. Please stop insulting me and this pattern, and all similar patterns by other designers for that matter, solely because of your political opinions. Thank you. I’ve received many messages asking about and/or saying that the ears are missing from this pattern. They are not. The pattern is worked into a rectangle and sewn across the top, and the top corners of the rectangle become the ears when worn on the head. Some people have mentioned that you can sew at an angle to make the ears more pronounced, but I find that with bulky/double stranded yarn there is enough support to hold and shape them just fine without any extra sewing. 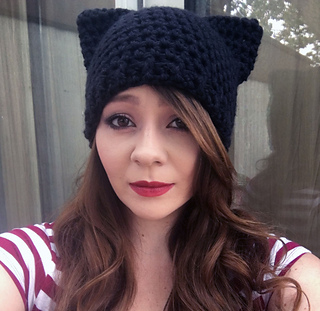 Cat ear beanies are so cute! These are made with bulky weight yarn (or double strand worsted weight, the hats pictured are made with 2 strands of Caron Simply Soft) so they are thick, super soft and so warm. Any cat enthusiast would LOVE these, they make great gifts! This is a very easy free pattern, perfect for beginners! You should be comfortable with stitches like dc, hdc, fpdc and bpdc before trying this pattern. The pattern is one size and will fit most adults. Play around with the number of beginning chains to adjust the size.